During the 1940s, New Hampshire had captured the attention of other states with its development of Cannon and Sunapee as lift-served, state owned ski areas. The Connecticut State Park and Forest Commission, led by Chairman George C. Waldo, put some consideration into undertaking a similar effort. While Haystack Mountain in Norfolk had a ski trail, a larger development may have been considered. 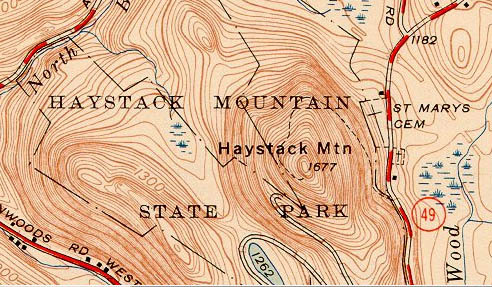 Noted for its above-average snowfall, Haystack Mountain was one of a few places named as a possible location for an aerial lift of some sort. The vertical drop of the area would have likely been around 400 to 500 feet. It is not known how serious or advanced this proposal was, but it is thought the lift served development on Mohawk Mountain in 1947 may have ended talk of the Haystack Mountain proposal. There are no known remains of the Haystack Mountain ski area.
" Among Connecticut skiers there has been some talk, or possibly wishful thinking, about a large skiing area in the state including an Alpine lift, rope tows, practice slopes, and instructors. The idea is to provide for skiers the same type of partially self-supporting recreation area as many cities provide for golfers. Because of the nature of a ski area it would have to come under state supervision. The initial outlay would probably be from fifty to a hundred thousand dollars. " " Arguments for such an area are that localities such as Norfolk or Hartland have as heavy a snowfall as many of the public developments in New York and Massachusetts, and that the exercise which skiing provides is an excellent body builder for the youngsters and much needed relaxation for their parents. " Britton, R.D. "Along The Ski Trails" Hartford Courant. 21 Jan. 1942.